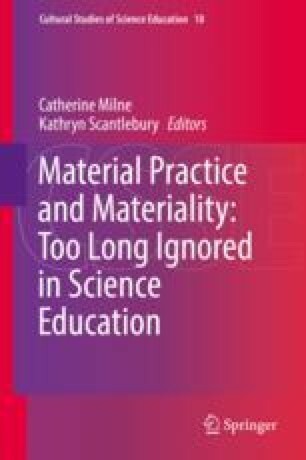 The chapters in this edited book explored the role of material culture in research while also challenging the reader to ask themselves how the material may have been written out of the accounts they have written and whether material culture deserves more attention from disciplines like science education than is currently the case. From constructionism and epistemic things to feminist new materialisms-post-humanism, authors of chapters in this book used various lenses to theorize their adventures with the material. In order to address the question of how can we take matter seriously, the authors explored specific practices that serve to entangle humans and matter in ways that support knowledge production. However, if we have learned anything through the writing of this book, it may be that, like all dualisms, the material and the social are entangled and culture emerges from this entanglement. Barad also challenges the coherent narratives that are used to tell the neoliberal story of scientific progress as the steady refinement of scientific knowledge over time, discoveries that led humans out of the morass, and “the swamp of ignorance and uncertainty to the bedrock of solid and certain knowledge” (Barad, 2010, p. 244). She notes that the history that gets told is really a temporary sedimentation based on the cuts made to establish some form of causation. The lack of absolute boundaries means that what we present as the present is a creation, as is the past and the future. One might expect that there remain specters or ghosts that haunt the constructed phenomena that might become solid if the cuts are made differently (see Barad, 2010, 2014). For us, applying Barad’s notion of hauntology means that neither the social (linguistic, immaterial) nor the material (bodies, matter) is privileged, opening us to an onto-epistemology in which both the social and the material are non-anthropocentric and non-linguistist (Dolphijn & van der Tuin, 2012). We recognize and acknowledge the challenges associated with questioning the dualisms that populate thinking and doing. For example, it makes no sense to separate the material from the social when considering culture since, as we have argued, any consideration requires both. If we were to adopt one of a dualism to the exclusion of the other, we would be haunted by the possibilities we have missed. However, existing educational worldviews tend to privilege one dualism, the social with its focus on text and language, so our chapters emphasize the role of matter in both ontology and epistemology because the material has been ignored for so long.